Find free classifieds for Musical instruments for sale or to buy in West Bengal. FREEADS in India offers you a platform to post free advertisements or classifieds for Musical instruments, West Bengal. FREEADS in India helps you search, find, buy, sell, rent or hire in various categories like apartments, goods for sale, local services, cars , jobs and many more in West Bengal. Shown below are ads available in Musical instruments, West Bengal. You can use search box above to refine your search. Chancellor beginner's drum kit for sale(colour navy blue).The kit consists of a snare, bass, two hanging toms , a floor tom , a hi-hat and a crash cymbal. Brand new condition and properly tuned. Drum seat/Drum throne and vic firth drum sticks for free.Interested buyers contact at the earliest..
OFFERING A IBANEZ RG350MDX GUITAR FOR SALE. EXCELLENT CONDITION, 4 YEARS OLD, BUT USED ONLY FOR 1 YEAR. 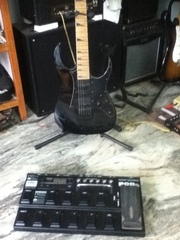 PRICE : INR 20, 000.00 OFFERING LINE6 POD XT LIVE ALONG WITH METAL, POWER, CLASSIC AND FX JUNKIE PACKS INSTALLED FOR SALE. PRICE INR 20, 000.00 ALSO OFFERING THE SAME FOR EXCHANGE WITH A ROYAL ENFIELD BULLET 350STD. India ads for Musical instruments, West Bengal, Musical instruments free ads West Bengal, Musical instruments for sale West Bengal, Musical instruments to buy in West Bengal. This page is a classified ads listing for Musical instruments West Bengal. This listing includes classifieds for sale and to buy in West Bengal. If you posted an advertisement on Musical instruments, West Bengal before please use Edit my ads button to change or cancel your ad. Musical instruments West Bengal ads West Bengal, Musical instruments classifieds West Bengal, Musical instruments free ads West Bengal, ads for sale West Bengal, ads to buy West Bengal, FREEADS in India. Find here ads for sale, to buy and rent in West Bengal. Goods for sale in West Bengal, vehicles for sale in West Bengal, West Bengal real estate for sale, West Bengal property for sale, property for rent in West Bengal, business ads in West Bengal, West Bengal business classifieds, services in West Bengal, West Bengal services ads, jobs in West Bengal, pets for sale in West Bengal, West Bengal dating, West Bengal cars for sale.